Sprung knees is the result of some disease not yet understood. We often find a horse with straight legs who will, without any noticeable cause, begin to set his knees forward, and in the course of a year or two the animal will have become totally useless. From the above we learn that it must be something else than bad shoeing which has caused this deformity. 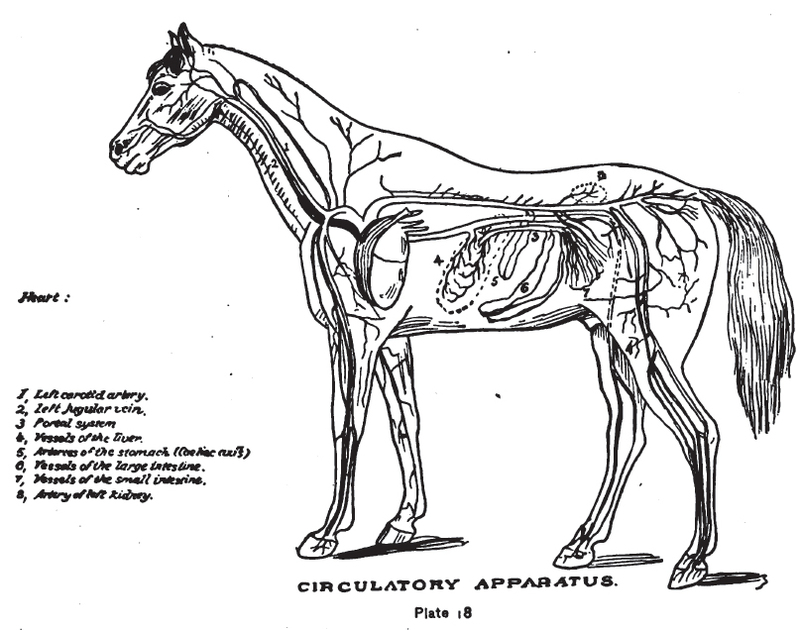 A horse with sprung knees is liable to become weak and debilitated from want of rest, and the strain enforce on the animal in order to stand. It will be noticed that a kneesprung horse cannot sleep standing, for he will fall as soon as he goes to sleep. In a straight leg the center of gravity is down through the center of the leg and out at the heels. This is changed in a case of sprung knees. 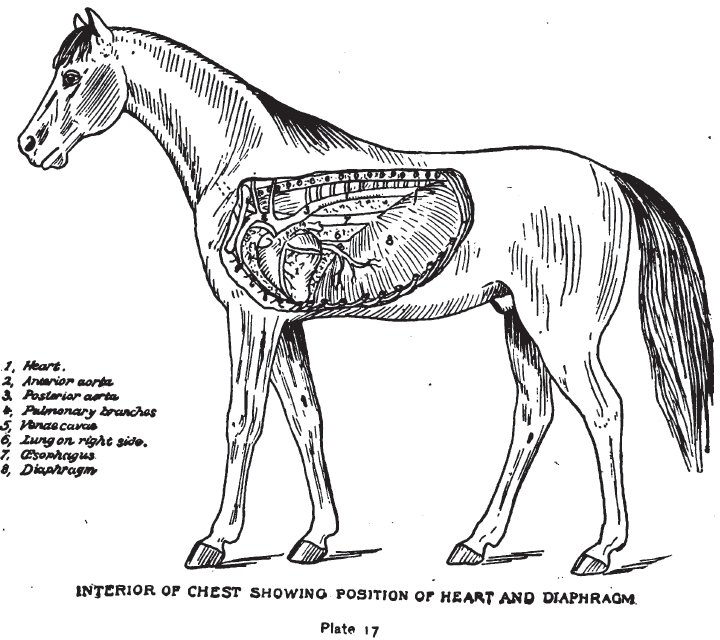 Here the center of gravity is through a line forward of the suspensory ligaments and the result is that the horse must stand with an effort to hold the legs from doubling under him; hence it is tiresome to stand, and the horse will get worse and weaker. There is very little for the horseshoer to do in such cases. Shoes with high heels may relieve some of the strain on the back tendons. Showering with cold water several times a day for a week or two and rest in the pasture may help. Shoeing kicking horses is both dangerous and hard labor. It is no use for a man to wrestle with a horse, as we now have so many different kinds of devices for handling vicious horses that any shoer can have at least one, and even several of them at his disposal for a nominal cost. 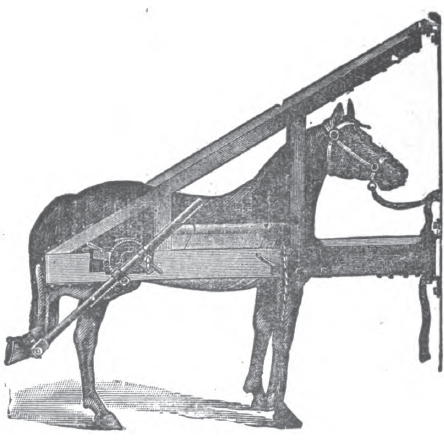 In this device the horse will hand with his leg in his tail, and although he may make some effort to get loose in the start – probably throw himself – he will soon submit and in most cases never move a muscle. I have not yet had a case where I did not conquer the beast with this apparatus. Another device is the sling. (See plate 28.) When the horse is ready to be raised, tie a rope around the foot to be shod, and when the horse is raised pull in the rope and the foot is easily managed. 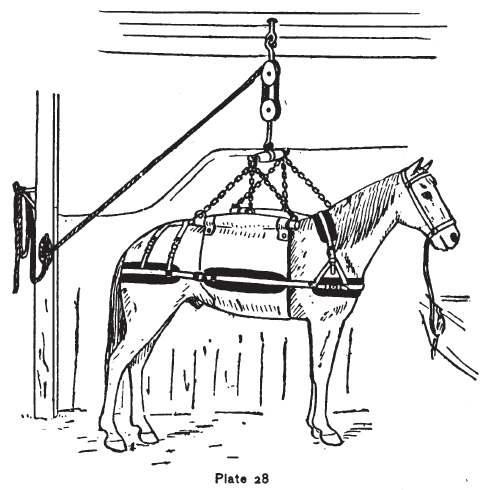 Shoeing racks are also manufactured and sold to farriers. 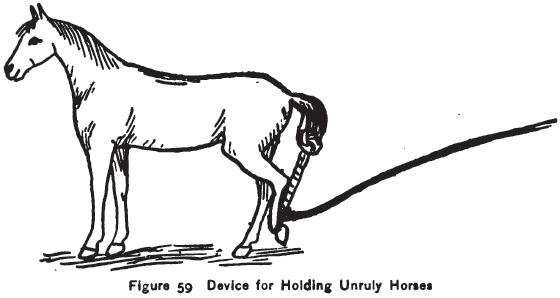 The Barcus Stocks manufactured by George Barcus & Co., Wabash, Ind., is the simplest and most convenient device for holding vicious horses. See illustration.